What can I do within the Online School Manager? How do I access the Online School Manager? If you don’t have a local Manager installed or just need to be able to access reports from anywhere, this tool is for you! 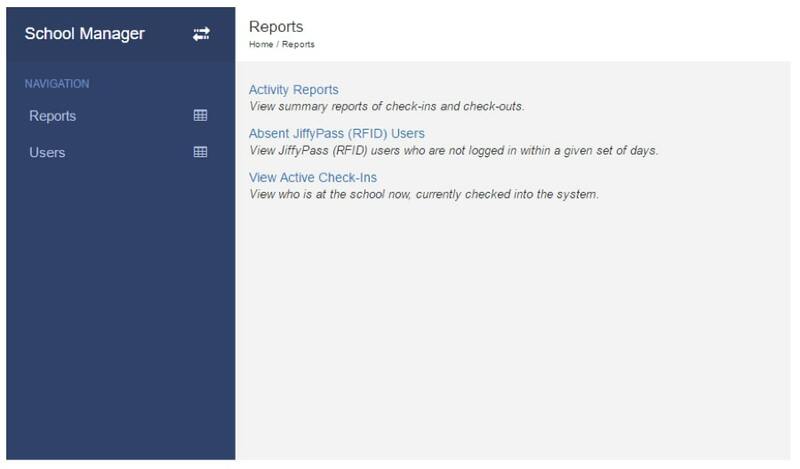 It allows you to view and save reports, view RFID and Preloaded Lists and view anyone currently checked into the system, using any web connected device. Navigate to https://school.ccssvm.com. You must request access to the school manager prior to logging on to this website. Contact us or your local director for assistance with this. Once you are logged in, you will see a screen similar to the one pictured below. Trained Technical Support Representatives are available to help you from 8:30 AM to 5 PM EST. The support phone line is available from 7 AM to 7 PM EST. Our Video Support Series is also available online. For additional support please click here to contact us or fill out the form provided for more help.